This is a really old edition of Media Network, from November 1986 when I visited what was then called Stad Radio Amsterdam. Since then, I don't believe Amsterdam has really been the success story of local public broadcasting. Stations in Rotterdam and Eindhoven sound a lot closer to the people than AT5. In the Netherlands, there seems to be a policy of building regional public broadcasters on industrial estates. Yes, it's cheap land. But it doesn't encourage close contact with the people. Radio stations, in particular, need to be seen operating as well as heard. Look at the success of campaigns like the Glass House or the Radio 2 cafe in Hilversum, Holland. Out of site means definitely out of mind. Which these days means out of business. It's fun looking back at 2012 and reading what others found to be the highlights. But I note that events older than a couple of months rarely figure prominently. My theory is that, without the aid of media to remind us, we have a collective memory for current affairs of about 6 weeks. So I don't see the KONY 2012 project mentioned anywhere. Remember this viral video? I note that the counter on YouTube is currently at 95,739,821 views. But when I see articles this week indicating that YouTube is revising down the number of page views claimed by record companies (by a collective billion views) then I begin to wonder whether 95 million people really watched this documentary all the way through or whether some clever software didn't help to boost the numbers. But even if the number of pageviews is really half that being claimed, it is certainly one of the most successful videos on Youtube, especially as Gangnam Style (now on 1.08 billion views) is not a documentary with a call to action. And then we had that weird report of the Kony Founder, Jason Russell, being arrested on March 15th 2012 for screaming at traffic while being naked. Since then, not a lot of positive news about KONY. Until now, when around 8000 people have been curious enough to watch the end of the year report. The idea for the awareness and action campaign was actually around a lot earlier when the US organisation Invisible Children set up an early warning tracking radio network in the area where Kony and the Lords Resistance Army are believed to be hiding. It uses ham radio gear operating on shortwave (around 7 MHz) to link villages. There's also a separate network of 6 FM radio stations broadcasting regular messages from ex-LRA members encouraging them to defect. Invisible Children helps to construct stations and/or otherwise fund the transmission of the "Come Home" message. They're hoping to raise a further 100,000 dollars in 2013 to fund further expansion. They also run flyer campaigns reminiscent of the way the US military (psyops) have run pamphlet campaigns over Iraq, Libya and Afghanistan in the past. 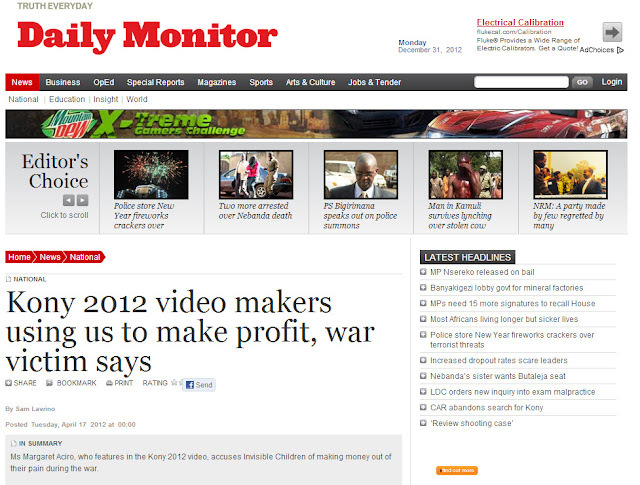 Invisible Children are masters in making video campaigns. But the story remains vastly oversimplified. We're not hearing much about the side effects is this campaign, which is increased support by the US for Yoweri Museveni, the dictatorial and kleptocratic leader of Uganda. I don't think we're seeing anything like the full side of the story as it plays out inside Uganda. Although Invisible Children are good at starting conversations and creating awareness, I doubt the long term impact. That's because it's not clear how the victims of the LRA are being helped by the Invisible Children campaign. 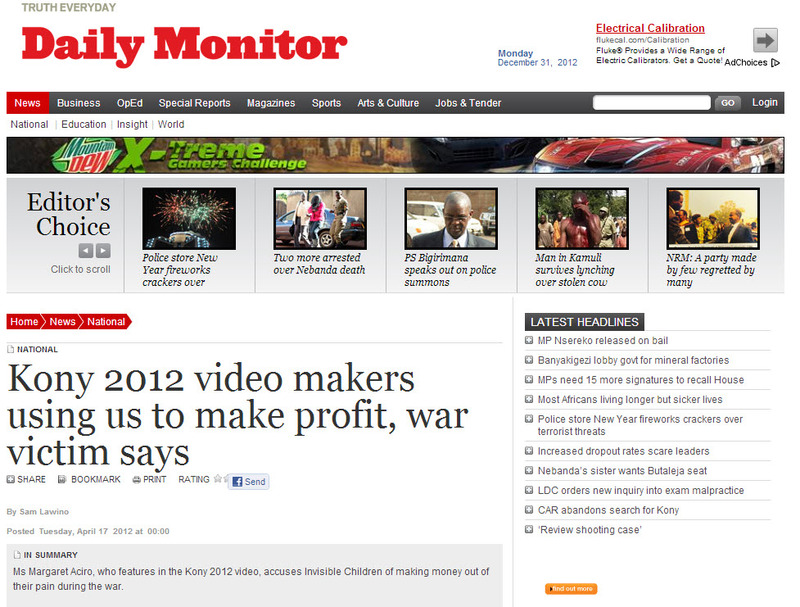 Indeed the reactions to the Happy Clappy video produced below were apparently rather negative in Uganda itself. All this is several months ago, since then silence. YouTube has become the platform of choice in many Western countries to raise public awareness for any cause. More effective than many appeals on traditional radio and TV. Radio, especially FM Radio, is the most effective way to connect these particular groups of people. The message to come home is mixed in with music and other local news, all in local languages. If only the same sort of funding went in to regional radio projects in Somalia. Invisible Children says it's helping to set up the stations - although to what extent these stations will survive if Kony is captured remains to be seen. I thought the best and most constructive criticism of the KONY campaign came from Ethan Zuckerman and Visible Children. Haven't seen much in the way of specific answers from Invisible Children. So, I have to say that although their method has all the hall-marks of military precision, I believe there are other more important priorities. And where is mainstream media when it comes to investigative journalism? Too obsessed with other distractions like a Fiscal Cliff. Update: Jan 15th. Views of this particular post are off the chart. I guess it's because I tagged it with KONY. UK is the storyland, The Netherlands is transaction land. Businessweek made a list of the worst CEO's for year. But what about broadcasters? Piers Morgan is on my list. He's hopeless at handling a fiery discussion, turning it into a shouting match and so turning off the audience big time - whether pro or con the motion. No wonder he has half the audience of the 11 pm repeat of the Fox's Bill OReilly. Around 550,000 people watch Piers Morgan in the US. Most people I know do not realise how low the audiences to rolling news channels really are. 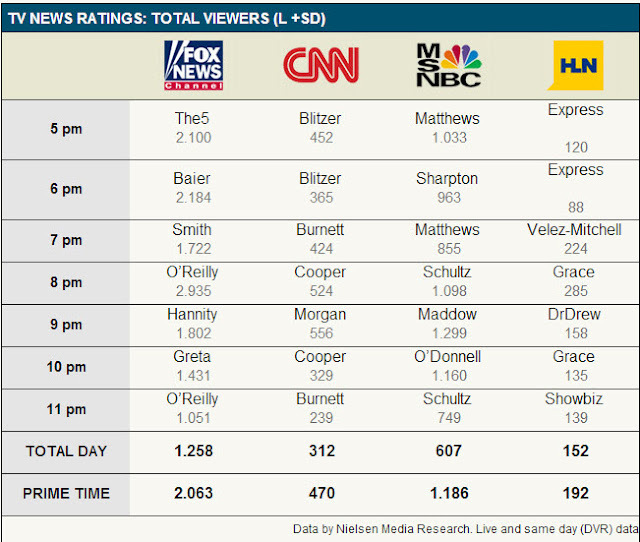 In a country of over 315 million, the figures below (in thousands) means no-one is really watching CNN. They have better things to do. 2.3 million watch Jon Stewart's Daily Show. He's is much cleverer at triggering a debate. 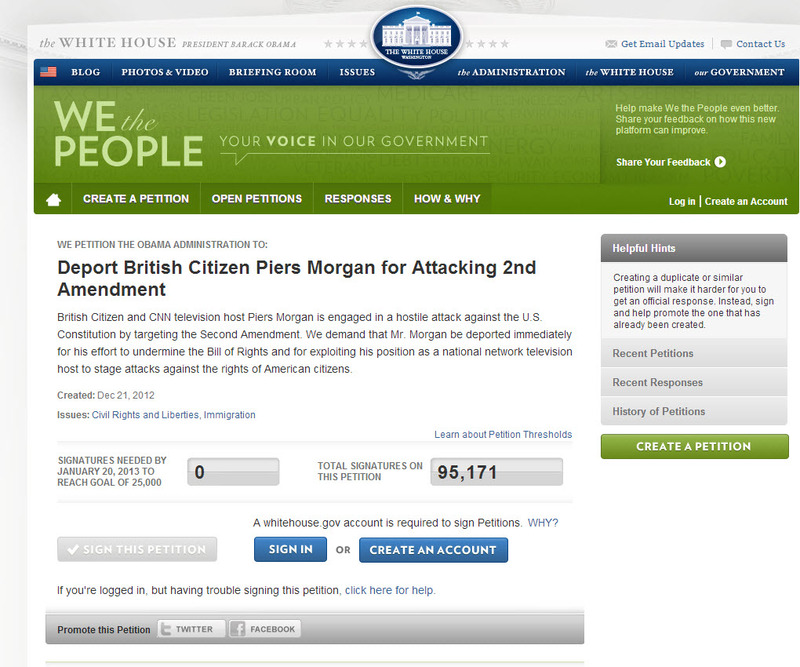 I see the current total of signatures to deport Piers Morgan from the US is now above 95,000. Of course this petition has no political value apart from publicity, although the White House does have to respond to a petition like this. I wonder who is really pushing this nonsense. CNN must be scrambling to do something about these ratings, right across the network. May be they simply need to fire him. Sad to discover today that Dutch radio newreader and presenter Arend Langenberg has passed away at the young age of 63. He had one of the most distinctive voices on Dutch radio, being heard first on the public networks when they took the news from ANP, and later as the distinctive voice of Sky Radio. Met him a couple of times and instantly liked him for the way he would share his knowledge. He knew what made a good story and was full of anecdotes. Nice man, always willing to share ideas, great sense of humour and its a real shame he went so soon. Remember meeting him on a plane with Adam Curry of NoAgendaShow fame when Curry went with Langenberg to do programmes from Camp Smitty in As Samawah, Iraq when the Dutch troops stationed there. NOS TV did a tribute to him (in Dutch). All this reminds me of the other great voices that are no longer with us. Don LaFontaine for one. Skip the first 30 seconds to watch an interview made with legendary US DJ Wolfman Jack. It dates from 1995 where he points out that the problem with computer playlists is that they have no soul. With some stations I listen to on my Internet radio (very briefly), it would appear the memo from the Wolfman still hasn't reached them. Had reason to find out more about the city of Poznań in Western Central Poland. Didn't know about the 7th International Ice Sculpture festival held there last wek. 24 competitors from 9 countries. And beautifully filmed in the old Market. I love this time of the year. A chance to reflect - and research. And I'm finding more and more fascinating work on the Vimeo website. The 18 minute documentary entitled "Connecting" is an exploration of the future of Interaction Design and User Experience from some of the industry's thought leaders. As the role of software is catapulting forward, Interaction Design is seen to be not only increasing in importance dramatically, but also expected to play a leading role in shaping the coming "Internet of things." 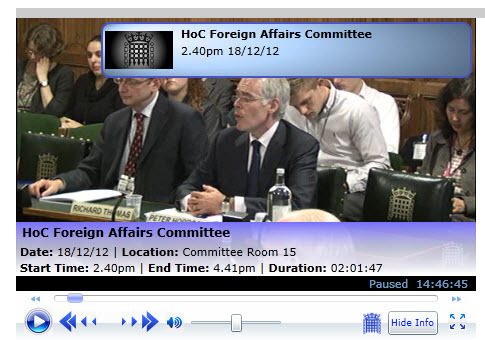 As someone still interested in the effectiveness of international broadcasting, I find the sessions held by the UK Foreign Affairs Committee to be very interesting indeed. It is all too rare for government committees anywhere to take a serious interest in external broadcasting. In fact, I don't believe any other country goes into this level of detail about what it is trying to achieve through its media efforts abroad. Although the committee is clearly in favour of a strong BBC World Service, it does manage to pose awkward questions during the hour-long session. I thought the responses by Peter Horrocks were more robust and confident than in 2011, indicating to me that the organisation is climbing out of the savage financial cuts that hit them nearly two years ago. That the UK government doesn't apply a similar restriction on Chinese media operating out of the UK to the same extent as imposed by Beijing on the Mandarin language service of the BBC. This would mean that accreditation would be granted to Chinese domestic stations but not to CCTV English language journalists. With the growing importance of TV for news, why doesn't the radio output broaden its perspective and make more use of the excellent material running on BBC domestic channels. There is some evidence of this, although why programmes like More or Less have to be chopped into pieces before they are fit for a world audience remains a mystery. And the World Service hasn't run any comedy in this Millennium. Which is a pity because the UK has some of the best political commentary writers and performers on the planet. BBC World is clearly a rolling news channel, with language services providing video material either for use in daily TV shows (like in Swahili) or for on-line. But when it comes to radio, there doesn't seem to be much point in just doing a rolling radio news format in English any more. It's just the same news without the benefit of pictures. And the number of outlets willing to take that kind of international news is dwindling. So reconsider ways in which BBC World Service in English can complement TV output, rather than compete with it. In the battle between radio and TV, radio always loses out, usually big time. To be clear - I don't mean less output, I mean complementary output. BBC Global News seriously needs to review it's on-line and embedding strategy. The Russians and Al Jazeera are well ahead in understanding what YouTube and other channels can do for reach. TV is not the only replacement for short-wave wireless. The Facebook strategy seems to be all over the place. 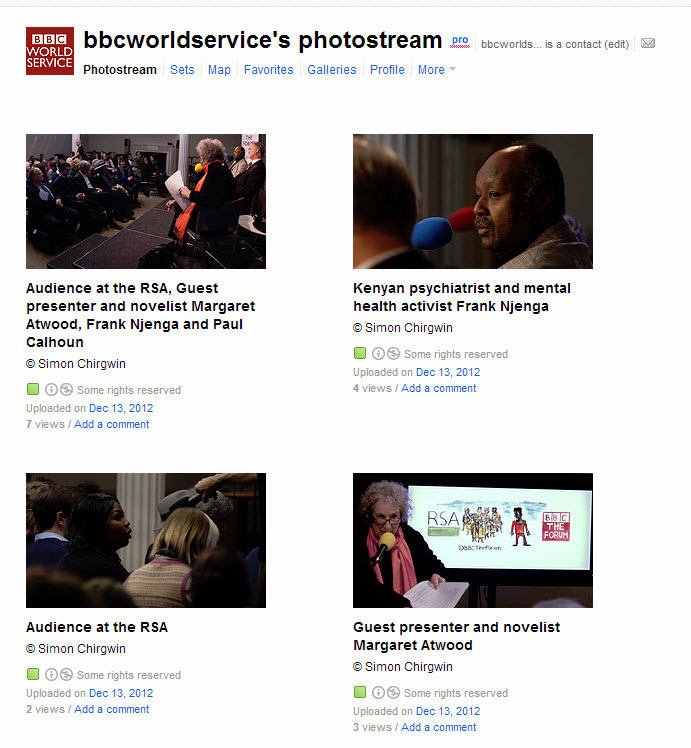 And no-one has found the BBC World Service photostream on Flickr. 3 or 4 views per photo? Either do it properly or not at all. Perhaps more serious, I feel the BBC World Service is moving even further away from a continuous dialogue with the audiences. The Global Minds panel doesn't discuss radio any more but is now focussed on trying to work out my emotional reaction to TV news programmes. 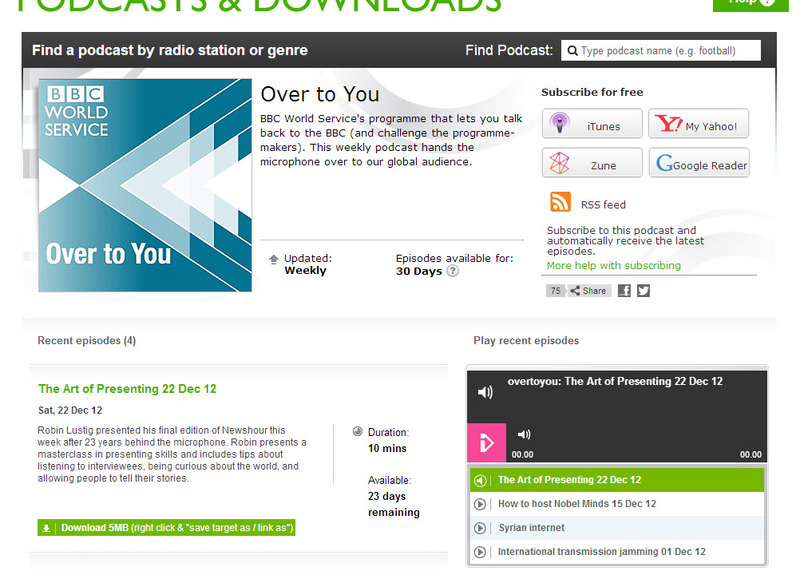 The Over to You programme on World Service radio is not a dialogue - not remotely similar to the BBC Radio Four Feedback programme, even though it appears to be made by the same independent production company. For one thing, Over to You seems to disappear from the site after a month (why?) when the Radio 4 equivalent always posts the entire series until the next season starts. The blog idea has been cancelled for a long while. Over to You says it gets lots of letters and phone calls - but how do we know that's really true and not "presenter fluff". What happens to those comments and suggestions? As a listener, I no longer believe I have much influence in shaping the output, despite what it says at the top of the podcast page. And maybe it's time to take the Zune button down? I also note that the BBC Trust, who will finance the BBC WS from 2014, will be organising a public enquiry into the World Service in the second half of 2013. I wonder if they will accept submissions from abroad ? I note that the embedding code from the site doesn't seem to work (perhaps it is restricted to UK?) but the video is watch-able on the UK parliament website from anywhere in the world. I appreciate that these sessions are made public. 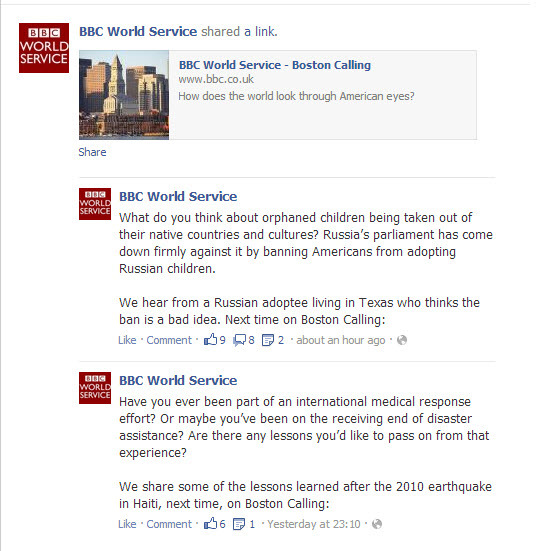 The BBC World Service still keeps a lot close to its chest. In some cases, that's understandable. Many reporters are working at huge personal risk to themselves and/or their families. But sessions like the one above are important. Why don't other countries do this? Frankly, I don't think they would dare. I think they may be shocked by the testimony that their respective international broadcasters would give. The vast majority of international sound broadcasting has become terribly dull and parochial - if it is still has a presence at all. And modern platforms have only exposed the fact that no-one is listening to it. Which means it is a waste of valuable funds which could be diverted elsewhere. Nostalgia alert: A radio Christmas spent in the Media Network studio way back in 1996. Sounds like we were having fun! I look back on this period as perhaps one of the golden years for Dutch external broadcasting, producing a range of documentary productions in English and Spanish and recording great concerts, both classical and jazz. This programme focussed on answering listeners letters on subjects like satellite television in Australia (DW was organising a bouquet of signals) and the major changes to the commercial radio scene in New Zealand. The auction of FM frequencies in the Netherlands and shortwave stations that sold radios were also topics for discussions. RBI archives have, for the most part, been destroyed. Swiss shortwave listeners were quizzed on their listening habits. The 410 ft tower formerly used by AFN has been dynamited out of existence. Capital Radio in South Africa is in trouble. Been looking at who are the best at sharing scientific information. Turns out the museums are getting better than many Universities. I would argue that the weblab that Google built with the UK Science Museum is one of the best. But what will they do with the collection when the year-long project is over? I'm reviewing radio's future for a couple of clients. In that regard it was interesting to read the texts of the top 10 radio commercials in the UK. Actually you have to listen to them to understand why they work - it's a combination of a great story matched with good acting and relevant effects. The problem is that work of this calibre has become so rare. Can you recall the ads you heard on the radio yesterday? No of course not. Because they were shouts not stories. And they're unlikely to be on YouTube or Soundcloud so you can't share them with friends. Following a tip from the December Earshot Creative Review, (highly recommended as always) I started exploring the great database of parody videos and audio clips produced by Brian McColl and Bren Russell who run the website called Gremlins in the System. In my work with radio stations searching for a sustainable business model, I've found the best way to explain good practice is to use examples of bad practice. Vincent Flander's site is one of many excellent resources. And UK TV critic and writer. Charlie Brooker made very funny episodes about the real life behind many TV production companies. His take on TV news packages has also become a classic. But when it comes to radio, I'd argue that the best examples of what's wrong with a lot of modern radio are in the Gremlins digital dungeon in Ireland. The stations have focuses on filling airtime as cheaply as possible, becoming slaves to transmitter and the clock on the wall. More radio students and station managers need to listen to this. Amd when you create a great radio commercial, make sure you pick the right voice. And ask a media student to write the copy. Where's the craft in radio ads? I still wonder why radio stations still bother with traffic news bulletins. Radio people are often poor with the written word. It's why they are on the radio. Because good written copy sounds terrible when its read out loud. And scripts look rubbish on the screen. Rolling radio news in the worst. It's breakfast TV without the pictures. None of the presenter's banter makes sense because none of it is theatre of the mind. My vote for the worst programme of this type is Newsday on BBC World Service. Try and listen to it live. Because finding anything later is simply impossible. And they're still in denial I am afraid. And this interaction with a caller is too typical. 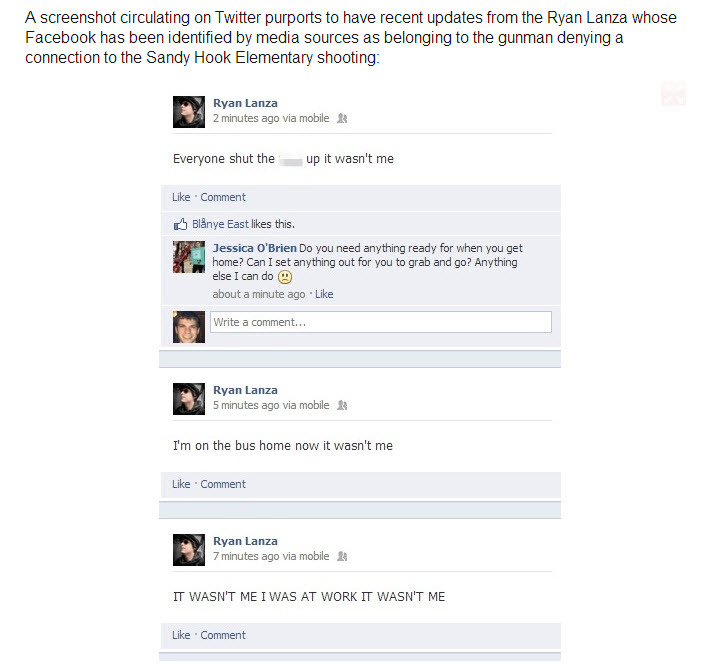 Social Media is not radio's friend if it's used like this. And many station promotions are so low budget as to be worthless. So what's wrong with music stations? While you're laughing remember that all this formulaic nonsense is what's killing radio. It's no wonder that advertisers are moving to other media. No real story = no real point. Audiences need to be at the heart of everything we do. Had the Internet Radio on today and was caught by Fi Glover's nice piece about DXing. Longtime since I have heard the term used on the mainstream wireless. 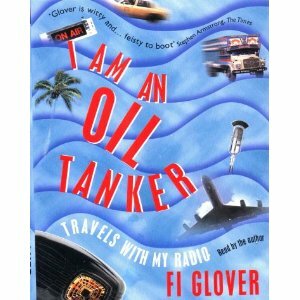 I missed this audio book when it came out. The Christmas programme can be listened to again for the next 7 days. Fi's piece starts at 48 minutes 29 seconds into the show. What a great celebration of radio at Christmas. 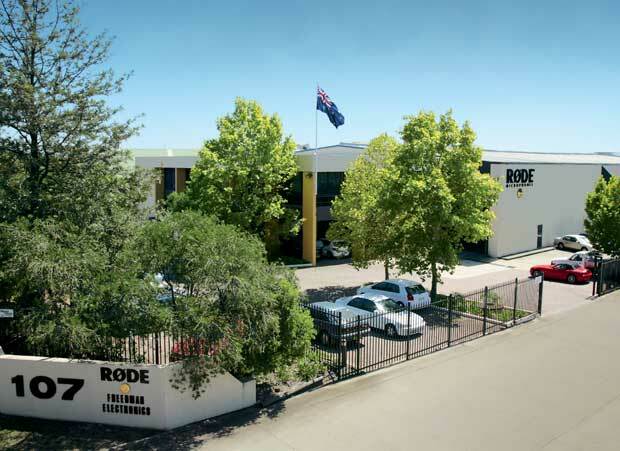 It seems a new dynamic mike is on its way from the great Australian company of Rode. Been very pleased with their equipment over the years after doing side by side comparisons with other manufacturers. So why do they ruin it with an ad with a presenter who's breaking all the rules of radio miking - including rustling the microphone lead (1'23"). And why does she need the headset mike as well? Another video to use to teach others what not to do. Isolated communities are the ones to be worried about in 2013. We all crave connection. The challenge that killed a lot of international broadcasting was the fact that in their case it was almost impossible to measure. This is the last chapter in the 8 part series telling the story of Radio Netherlands focusing on the English language department. With Pete Myers as your guide we focus on our present decade as it draws to a close. This final episode for was broadcast by several stations, including Radio Netherlands, on December 3rd 1997. It is presented here purely for academic interest. The programme was researched and presented by Pete Myers and Luc Lucas. I supplied some of the recordings from the Media Network archive. At the end of the 19th century, Oscar Wilde wrote that the only duty we have to history is to re-write it. When this decade is done I wonder what will have changed in the perception of Radio Netherlands in 1990's and the role it played in international broadcasting. The English service signed off in June 2012 ( found some other photos below than were published on the blog earlier). Let me draw your attention to the last part of this programme, where we projected what might happen at the start of the new Millennium. In fact, it all came to pass. I still firmly believe that great international broadcasting needs an emotional context in order to bridge the cultural and political barriers. Without it, there doesn't seem much point any more. Interesting that a simple emotional video on YouTube this Christmas went viral within a couple of hours - 4 millions views and counting. Nothing changes! The days of any form of effective government-driven propaganda are over. Actually, I would argue that government radio has never been effective, especially internationally. People share ideas with people, not government public relations officers. This is edition 7 of the 8-part documentary series on Radio Netherlands focuses on the 1980's and what it meant to the English language department in particular. It was a decade in which many women producers arrived, breaking through what had been a mainly male dominated radio station. Names such as Veronica Wilson, Dorothy Weirs, Dune Porter, Ginger da Silva, Martha Hawley, Marijke van der Meer and Anne Blair Gould. News to Africa and Asia was regionalised. The decade started with a coronation in the Netherlands and a speech by US President Reagan about the evil empire. The massive delta-works were completed, making Zeeland less vulnerable to flooding from the North Sea. Taboos were broken in Rembrandt Express and the decade ended with fall of the Berlin Wall. The series was written and presented by Pete Myers, with research from Luc Lucas and audio contributions from the Media Network archive. This programme was originally broadcast by several stations, including Radio Netherlands, in October 1997. It is released here for academic purposes only. Don't try this at home. In fact, cooking vegetables at the base of a high powered antenna blasting RF through your body means you must be on the verge of insanity or deciding to call it quits. Not sure of the authenticity of this video of course, but it looks to be stupidly genuine. Once again, RF causes horrific burns. 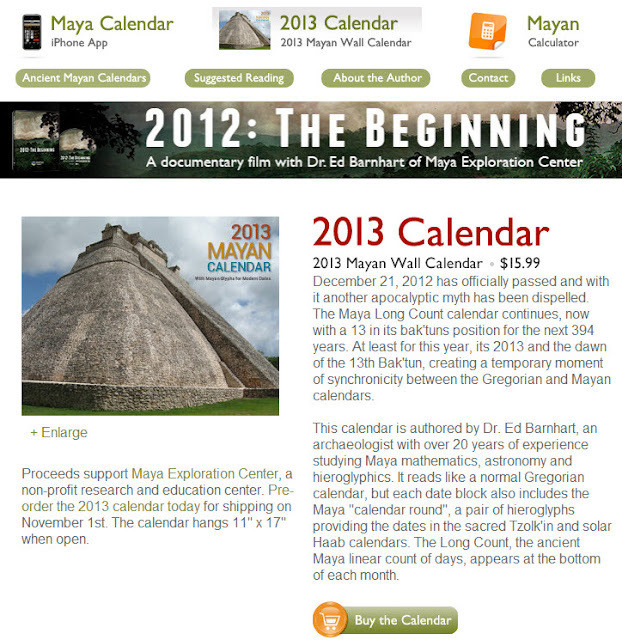 Mayan 2013 Calendar is Out! Lot of bla-bla on my wireless today about the Mayan Calendar and the end of the world. Reminds me of the Beyond the Fringe End of the World Sketch from 1962. Beyond the Fringe was a British comedy stage revue written and performed by Peter Cook, Dudley Moore, Alan Bennett, and Jonathan Miller. It played in London's West End and then on New York's Broadway in the early 1960s, and is widely regarded as seminal to the rise of satire in 1960s Britain. More details from the great book of knowledge, here. But my prize for publicity goes to Dr Ed Barnhart who registered mayan-calendar.com for all the right reasons. From a base in Austin Texas, he heads the Maya Exporation Center. He has over two decades of experience in Mesoamerica as an archaeologist, an explorer and an instructor. He is a Fellow of the Explorers Club, has published many papers and appeared in over a dozen documentaries about ancient Maya civilization. In addition to archaeological investigation and teaching, the center seeks to support the illumination of ancient traditions still practised among the modern Maya. In doing so, MEC aims to better understand the ancient ruins and celebrate the modern Maya as the descendants of one of the world's great early civilizations. MEC's research is disseminated through educational travel courses, tours for the general public, lectures, and a website (www.mayaexploration.org) where various educational and informational materials and resources are made available. They have a great calendar too for US16. Who would have thought? Great montage by three clever animation students in Montreal, which bagged them 5 million in 24 hours. I see the tally is now beyond 24 million! More details and a frame by frame analysis at NPR's blog. Seems they also did an earlier montage which appears to show an escaped penguin. Brilliant publicity for the centre where the students studied. Someone must be delighted at the free publicity. Why spend any money of advertising courses, when you can use great content from alumni! Created in the Fall of 2010 in association with UQAC, Centre NAD’s 3D animation and digital design bachelor degree is primarily aimed at students finishing their CEGEP or university studies in the field of visual arts and at people who hold relevant experience in visual arts. It is a solid professional training program that allows students to master the theoretical and practical bases of 3D creation in today’s world. During their training, students must choose one of two concentrations: visual effects for cinema and television or video games. The three-year program (90 credits) thus aims to answer the industry’s needs. More and more, it requires qualified manpower at the cutting edge of technology and creative innovation with both technical and artistic skills. 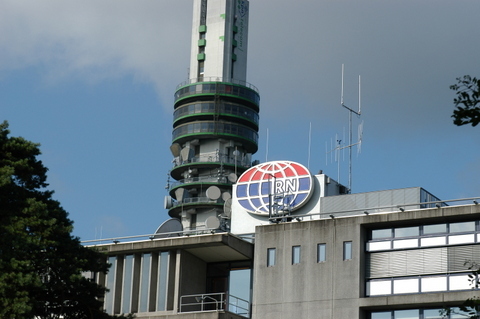 The sixth part of the history of Radio Netherlands was originally broadcast on October 1st 1997. It's presented here for academic interest. Radio Netherlands got a shock awakening in the seventies from its cocoon of request shows and Holland promotion. Pete Myers opens with words which could equally well apply to 2012. It was the decade of the attacks on Israeli athletes at the Munich Olympics in 1972 and the resignation of President Richard Nixon. The age of the common man had passed to become the age of the common crook. The US pulled out of Saigon. A Dutch correspondent was one of the last to leave Vietnam. No baggage allowed. Was Dr Spock was the architect of the permissive society? Spock says it was connected to his opposition to the war in Vietnam. ABBA wins the Eurovision Contest in 1974. After some internal opposition, Radio Netherlands added news and introduced current affairs coverage with Afroscene. Tom Meyer took over Eddy Startz at the helm of the Happy Station interviewing the Dutch band Shocking Blue. Roger Broadbent, later head of Radio Netherlands English Department says farewell to Fritz Greveling, the fourth DX editor of DX Juke Box. Roger Broadbent later went on to a career at Radio Australia in Melbourne. So the Russians like chucking boiling water out of the 6th floor and watch it freeze on the spot. Must be rather boring television in Novosibirsk. Thanks to David Swatling for spotting this mixtape vid. It’s been 50 years since the first cassette tapes were produced and we wanted to produce a project to celebrate the format that brought us mixtapes and gave birth to the revolution of home sampling and affordable multitrack recording. This second part of the look at the station in the 1960's was originally broadcast in July 1997. Pete Myers recalls the plans to put a man on the moon before the decade was out, and the Erasmus Prize went to Charlie Chaplin. There are extracts from the last Happy Station with Eddy Startz and the popular His and Hers Show with Dody and Jerry Cowan. Perhaps you remember Bed-In for Peace campaign that John Lennon and Yoko Ono launched from their bedroom in the Amsterdam Hilton Hotel in March 1969. This part four of the eight part story of Radio Netherlands, the Dutch international broadcasting service.This first part of the look at the station in the 1960's was originally broadcast in July 1998. It recalls the opening of the Anne Frank House in Amsterdam and the visit of David Ben Goerion to the Netherlands. 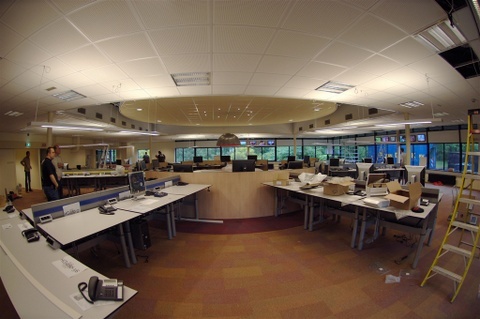 Radio Netherlands moves from old studios in the Bothalaan to a purpose built studio complex in the North of Hilversum. Reporter van der Steen does an interview with the architects. Pete Myers doesn't recall seeing many rabbits from the studio window. We also recall thoughts about the European Common Market, the Berlin wall and the assassination of President Kennedy. The second part of the sixties is covered in programme 5. The programme was written and presented by Pete Myers with additional research by Luc Lucas. I found the clips with the architects buried in the archives. Techcrunch seems to be taking a lead in organising pitching sessions in major European capitals. The latest has been in Barcelona, a city which has always fascinated me. The Catalonian capital captured the largest mobile congress on the planet away from Cannes, France and despite the recession, that particular conference continues to grow. In fact, in 2013 it will move to a larger location just down the road which is double the size. Amazed at what has happened in the lighting industry recently. These lights are expensive but so incredibly flexible. You'll need two at least. Here we go again. Trial by the media of people using social media. Why bother to fact check anything? Not only does a small team in Half Moon Bay, California come up with awesome sports cameras, they get the public to make awesome material for use in their TV commercials. And they use haunting music that I can't get out of my system. Challenge is the only way to do that is to sing the tune out loud. Works in the beginning, but not later! I think they should put a clearer link to the great theme music on Soundcloud. Looks like I am not the first to discover this! Successful Media campaign to help rescue dogs. They are certainly not dumb animals. Seen this story all over the place in various versions, though most of the footage was shot by the home during the training. This is the best video though. Chinese Puzzle - What's the vision for the new RNW? Holland Style from Moment4us on Vimeo. What's left of Radio Netherlands Chinese department has released a video they've made together with a small video production company called Moment4us. They claim 250,000 views in a couple of weeks, the majority from inside China. But what's the story? How will this build a community of followers? I can see how this video might benefit a Chinese video production company. But not how this video fits in with the new vision for Holland's external broadcast. For a company now spending 1.16 million Euro a month of taxpayers' money, I wonder how on earth they can justify this level of production. Continue to be amazed at both the growth and strategy of Poikos, the computer vision company started by Eleanor Watson. Today is a big day for them as they launch their API for developers - in fact anyone who wants to tap into their very advanced computer vision technology. In this video Eleanor explains how they have been surprised as the reactions they got from beta launch partners. Eleanor timed the launch for 1212 UTC today. Which is when this blogpost should launch too. On one of the coldest days of December so far, I give the two guys trying to sell subscriptions to the Telegraaf newspaper get points for trying. This was outside a local shopping center. They got people to chat, Except that they couldn't answer my question as to why I would want a paper in 2012? I read everything on-line. Wouldn't dream of going back to newspapers. Miss it for lighting fires, but not for the news. The subscription is 152 Euro per 6 months! Looks like Facebook users don't want the current Facebook Data Use Policy to change. 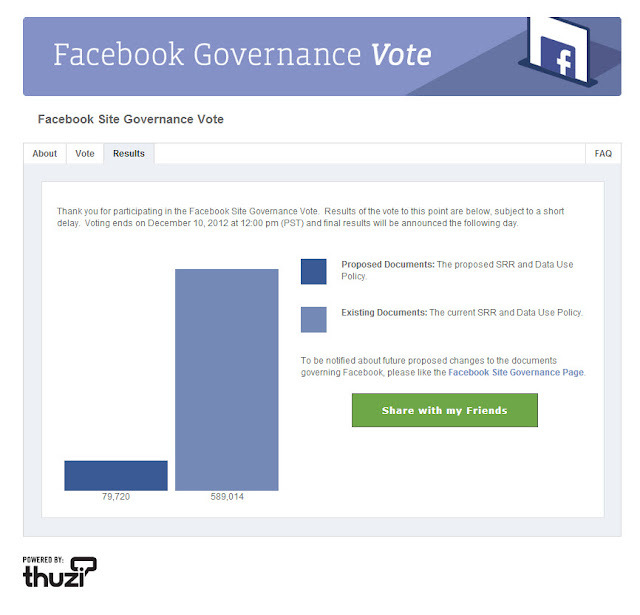 At least, not to the one being proposed by Facebook. But are they happy with the current conditions? Facebook doesn't say. This is an extract from an earlier post, since there is a finally a debate going on in the Dutch parliament about the future of public broadcasting. It seems Hilversum seems to be winning the battle against the regional broadcasters. That's because the VVD doesn't understand that the folding the regional network into a national network won't work. It really needs to be the other way round. Otherwise all the regional programmes go national. I get the impression that the Media Fund isn't going to survive in its current form after 2017. But hopefully, some agreement will be made about input from independents. There was a lot of talk in June 2011 when the previous Dutch cabinet issued a 39 page letter to parliament explaining its plans for drastic changes to Dutch public broadcasting, regional, national and international. Time for an update. The fall of the Dutch government lead by Mark Rutte on 21st April 2012 meant that civil servants and politicians stopped talking in public about the reform plans. But clearly planning has been going on regardless. With the formation of a new purple coalition between the Labour and Liberals, the negotiated agreement for the Rutte 2 government have now been published (in Dutch of course). There are two bits about media in this document which struck me (my translation). Media. The (public) media policy guarantees an independent, varied and high quality offer, accessible to all layers of society. The current policy will be changed on a number of points. 1. The 13 Regional broadcasters will no longer be financed by the provincial government, but by the national government as part of their public media budget (also used to finance national public radio, TV and Internet operations). Cooperation between the regional broadcasters (who fall under the ROOS) and national public broadcasters (NPO and NOS), as well as the integration tasks, will lead to savings. These are estimated later in the same document to be 25 million Euro, with budget reductions to be completed by 2017. 2. We will reconsider the need for a Dutch Cultural Media Fund. The fund to stimulate press and print innovation will remain. So what could this mean? First a little context on the current situation. If you live in most parts of the Netherlands you have access to four publicly financed TV channels. Three are national, one is regional. The regional TV broadcaster gets its money from the regional government authority together with some advertising revenue. The three national networks get their budget from public taxation as well as advertising blocks. Remember this small country also has 7 national commercial TV channels plus nearly 50 other commercial TV networks that target the Netherlands with their (subtitled) content. Think of National Geographic or Discovery as well as some local commercial TV operations. It’s a zoo! And the market is totally saturated. Advertising revenue is under pressure (especially on radio). If you scan the TV channels (especially during the day) you’ll see that a country of 17 million cannot hope to generate enough relevant public content from within the Netherlands to fill four channels creatively. On the regional channels you’ll find a lot of webcams watching presenters in radio studios like the example above. At other times, these regional stations make between 30-60 minutes of original regional material a day and repeat it in a carousel format for the rest of the evening and into the following day. What some of them like Omroep Brabant, Omroep Fryslan and RTV Rijnmond make is generally good by international standards. Their costs for radio and TV production turn out to be a fraction of their counterparts in neighbouring countries. Some of the larger stations used to do quite elaborate outside broadcasts (usually at cultural events) but that has been severely curtailed in recent years. But there are also exceptions. I think still think that AT5 in Amsterdam is more chaotic than I have ever witnessed in any capital city. But apparently they are reorganising. Dutch public radio and TV carry commercials. The argument from the commercial broadcasters and the press is that they distort the market. The right-of-centre political parties, most notably the VVD, have said for decades that they want to reduce the number of national channels from three to two, making them commercial free. This is often referred to as the BBC model, even though it’s a model that the BBC was using in the 1970’s. Some people in the Netherlands think the BBC is still growing. In fact it is implementing a 16% budget cut at the moment. In the letter of June 17th 2011, the previous Dutch government said it planned a slightly different tactic. They would effectively broadened their cutting lens. Instead of reducing the national channels from three to two, they have included the regional networks, in effect going from four to three networks. Now the new Dutch government, Rutte 2, has announced this integration is going to happen, with the regional broadcasters looking to save 25 million Euro a year when the project is completed. Who will win control over the third network? 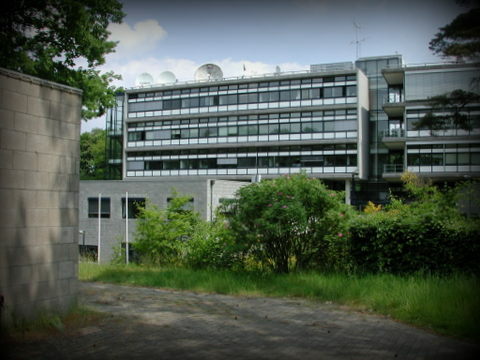 Since the regional TV distribution network has been designed so that viewers in Friesland see different programmes than in Rotterdam, it makes sense to retain this network when it fuses with the national networks in Hilversum. That means the existing Nederland 3 network becomes surplus to requirements. Since commercial TV networks have managed to blossom without building any terrestrial infrastructure like DVB-T, there doesn't seem much value in selling off the network. I guess it will go dark. I believe that if Hilversum gets full editorial control over the "new" third channel, it will mean that regional journalism is going to suffer the most. The national broadcasters always look for ways to cut at other places first before they look at themselves. I would argue that national broadcasters (like the BBC) have never really understood how to run regional small-scale production centres. When cuts come, they always affect regional/local stations first. And there's a definite heirachy between those who work in regional and those who work nationally. Of course, there is also a lot of pressure from local newspapers who are trying to run a commercial model in the face of plummeting subscriber numbers. They regard local public newsgathering as unfair competition. 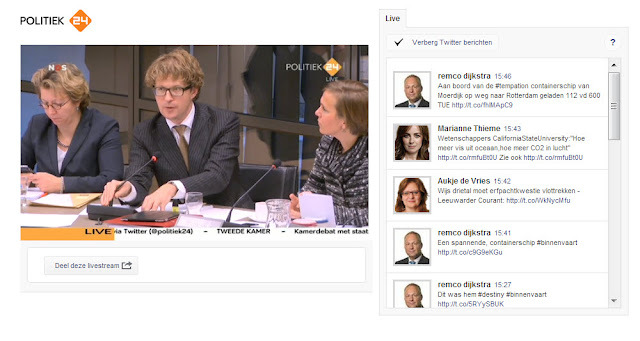 Ideally, the new public TV structure in the Netherlands would borrow more from the situation in Germany. Nederland 1 and 2 would be national. Nederland 3 would be a primarily a regional information network, carrying national productions (think of specialist interest) at other times. It would be a federated system. Factual news and current affairs coverage would remain in the hands of the regional centres. The other programming would be coordinated at a national level, probably by the NTR. The battles to come will involve who controls and commissions the schedule. Although, as more and more viewers are switching to on-demand, the discussion becomes more one of how to best organise how quality production rather than squabbling over who has rights to "prime time" or what constitutes a "public sport". I find the reaction from Hilversum to these government cuts to be poorly argued, confusing a discussion about being popular with explaining a role of what's meant by public. Last year the Dutch government announced it was shaving up to €127 million off the national TV/radio budgets, demanding that broadcasters merge rather than co-operate, though not offering a financial incentive for anyone to do so. It wanted to bring the number of public broadcasting production houses back to 6. That plan was cooked up in Hilversum. Now, the new Dutch government has announced another €100 million is coming off the public media budget. That includes closing that separate Cultural Media fund of 16 million Euro which has been used to stimulate independent producers and film-makers to do more investigative journalism as well as creative cross-media projects. Not surprisingly, money set aside to stimulate the commercial press has not been scrapped - right of centre commercial media has always been close to the VVD. But this decision smacks more of an unfair disadvantage to the independent production sector rather than bashing public broadcasting. Rather than just scrapping the Cultural Media Fund, I would be inclined to rethink commissioning and innovation as a whole across national public broadcasting, especially as the old public broadcasters like the TROS, AVRO, VPRO are becoming more and more like publicly financed production companies, with a production guarantee. I think only NOS, NTR, ROOS network and NPO are public broadcasters in the true sense because they have direct access to the airwaves. NPO commissions content from what have effectively become "public-financed production" companies like VARA, BNN, TROS, etc. NTR looks as though it will get the job of commissioning stuff from the aspirant broadcasters like WNL. If you don't earmark some money for experiments and innovation, then believe me it will disappear into more mindless magazine shows to fill traditional airtime. The Mediafund has been one small light of hope in the acidic cloud of despair and creative collapse that has destroyed Hilversum as a creative centre in the Netherlands. Killing that fund off, while retaining money to keep newspapers alive is sheer stupidity. And as I pointed out previously, Dutch producers need to understand that they will have to consider international markets in order to survive and grow. The Dutch market is becoming too fragmented and public opinion is dead against any subsidy models as we go through the second great depression. Gradually I think we're moving towards a system not unlike the UK channel 4 construction. This publicly-owned corporation (set up by Margaret Thatcher) has money but no programmes, production companies bid for tenders to fill the clearly defined slots. Production companies like the VARA, TROS which are really large "loyalty schemes" because they have a membership will compete against Endemol for slots. Because this kind of membership system will collapse (why pay an extra 15 Euro a year when these membership organisations are strictly limited in what they can do for their membership), the Dutch government has further marginalized their power and influence in Dutch society. That was definitely what the VVD has been trying to do all along. It is true that Endemol, Talpa etc have done a lot to innovate in game shows building a world-class reputation in this sector. I see lots of innovation in the games development sector and interface design as well. But when it comes to factual content creation, the great public science experiments, comedy driven factual programmes (like Qi), cross-media documentaries, and major investigative journalism formats are all being developed elsewhere in the world. Not surprisingly, the Dutch Media Hub has failed in trying to get foreign investment in the Netherlands without the right mix of technology, creatives and marketing. Because, just having two out of three spells disaster. With the bankruptcy of the Media Park company TCN, I'm sure some broadcasters will rethink if they really want to stay in Hilversum. I still find it incredible that with the creative sector being so important to the Netherlands, that there is no public debate on its future. Yes, there is a debate by incumbents in public. But there is no public consultation period in this country like you see conducted by Ofcom or the BBC Trust in the UK. We need the equivalent of OurBeeb.com. Public broadcasting in the Netherlands has a long way to go before it does things with the public rather than making programmes for them. Making the cut in Long Island. Le Web 2012 is impressive. Venezuela bucks the trend - but why?